Out in the garage the other week little Owl pointed up to the roof over my shoulder and asked, “Is that pollen mummy?” Clinging to the wooden beam was a cluster of carefully built little hexagons. As we watched a wasp whizzed past our noses. They were building a nest. 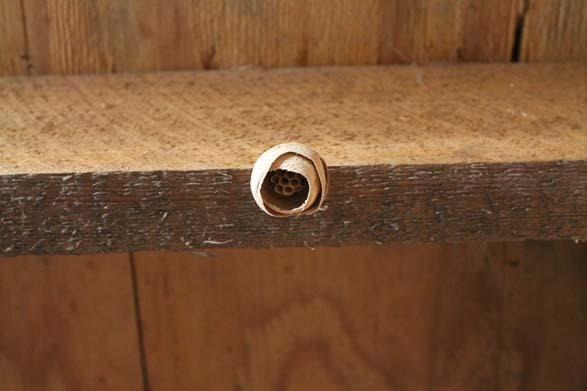 We were quite excited as we’ve hosted a wasp nest before and know how good they are for the garden. We’d rather have wasps than slugs any day (wasps eat slugs)! I was really proud of Little Owl for noticing it, even if she didn’t quite get the right word. Big Dreamer had been taking pictures of the nest as it progressed. Our intrusion was obviously not welcome however and sadly the nest has stopped at the stage in the picture. We’ve not seen anymore wasps coming in and out of the garage. This entry was posted in Wildlife and tagged garage, illustration, nature, slugs, wasps, wasps nest, wildlife. Bookmark the permalink.